New Barn Equestrian Centre in Ollerton, Chelford is playing host to a range of international trainers this year. The venue, owned and developed by Pam Rigby, a British Horse Society Intermediate Instructor, now boasts fantastic facilities including a double-sized indoor arena and lecture room. In the first 12 months since the centre was approved by the British Horse Society, four top level international trainers have used it as a venue. French classical riding trainer François Lemaire de Ruffieu, who trained at the Cadre Noir in Saumur and is now based in Florida, held an extremely popular four day clinic in the spring, and will be running a second clinic at New Barn from 9th – 13th September. Francois works inhand with Simba at last year’s clinic. Centred riding level four instructor Nelleke Deen from Canada held a training course and examination for British riders earlier in the year, while fellow Canadian Sue Leffler, a level four centred riding clinician, used New Barn as her north west base whilst on her British tour. 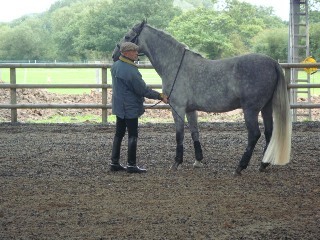 These clinics were organised in association with Lisa Pritchard of The Modern Horse, and further events are planned for 2013. This summer, Karen Lewty from the British Horse Society organised a two day dressage course with Manuella McLean from the Australian Equine Behaviour College. Despite her busy Olympics and Paralympics schedule, Manuella returned by popular request at the end of August for a second clinic. Finally, top Portuguese trainer Antonio Calamaros returns to New Barn for a second training clinic in September. As well as hosting these top-level clinics, New Barn is also a popular venue for local riding clubs and instructors. The facilities include overnight stabling, accommodation for riders, a classroom and “Rocky the mechanical horse”, a riding simulator that’s proving a great asset for instructors. Locally-based riders and clubs can also hire the facilities by the hour. New Barn also has its own riding club, New Barn Riders, who meet monthly for lectures, training and social events – find out more at www.newbarnriders.webs.com. For more information on any of the events at New Barn, please phone Pam on 01565 652784 or visit http://www.newbarnlivery.co.uk , or http://www.themodernhorse.co.uk/.